In 2011, the USTA introduced the 10U Tennis Pathway. While this pathway was rolled out in the Midwest for players under 10 years old, starting in January 2016, the Midwest Section will join the rest of the country and apply this to all players 10 and under. The format, using transitional balls and reduced sized racquets and courts, works by getting kids into the game immediately. Within the first hour of stepping onto the court, they are actually playing the game, rallying with one another, moving around and having fun. Scaling the game down to their size helps make the learning process easier and a lot more fun. The majority of youth sports have followed this very formula for years. Baseball begins with smaller bats, smaller fields and progresses from tee ball, to coach pitch, to player pitch. Basketball and soccer also employ similar methods, including shortened playing surfaces and appropriate sized equipment. That helps ensure that your kids' first experiences in the sport will leave them overjoyed - not overwhelmed. WATCH THIS VIDEO BY MASTER PROFESSIONAL JORGE CAPESTANY TO BE CONVINCED! The shorter and narrower courts give kids the confidence and ability to cover the entire court. Kids have trouble controlling full-sized racquets because they are too long, too heavy and the grips are too large. Junior racquets are proportionate in length and weight and have the grips that fit smaller hands. This makes it easier to control. And balls that bounce at a height equal to kids' playing abilities allows for better and longer rallies and allows them to build all-court games. By being introduced to this style of play from the start, your kids will gain confidence by seeing their own immediate progress, making them more enthusiastic about continuing to play and improve. 10U Tennis and Youth Progression enables kids to have more enjoyable experiences early on in the learning process and having fun is always a factor in keeping kids involved. across the width of a normal tennis court, with a portable net or tape dividing the court in half. baseline to the service line. Temporary lines (e.g., throw-down lines, tape or chalk) can be used to mark the boundaries. 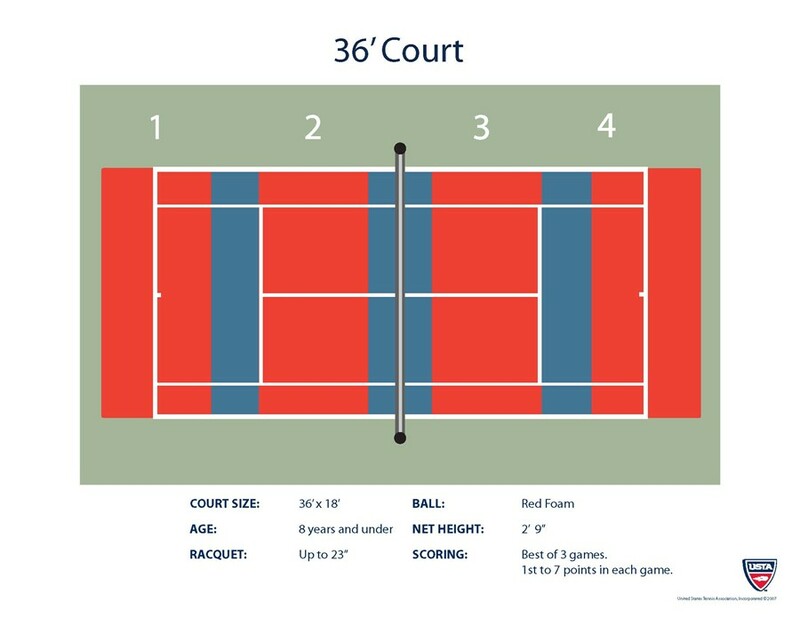 Since the dimensions are smaller, as many as four courts can be set up across one full-size tennis court. For this age group, the net height is 2' 9". lower and travels less distance. sweet. Kids play the best of the three games; the first to score seven points wins the game. The first to win two games wins the match. The longest a match will last approximately 20 minutes. Since nine- and ten-year-olds are typically taller and stronger, their court needs to be bigger. 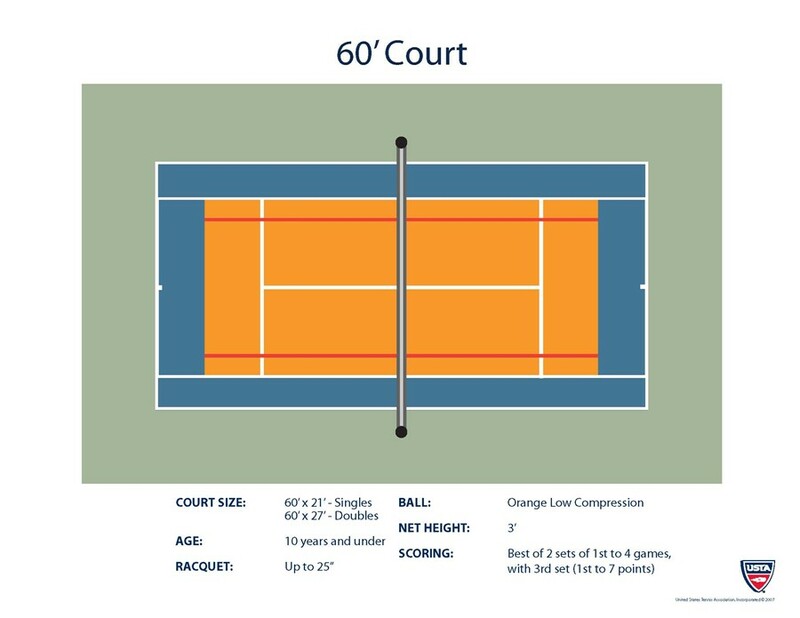 For this group, the court dimensions are 60' long and 21' wide. By using temporary lines (throwdown lines, tape or chalk) as baselines, the length of the court can be shortened by 9' at both ends to make it a 60' length. The singles sidelines are used to determine the width of the court. Again, temporary lines can be placed 3' inside the singles sidelines creating a 21' singles court and 27' doubles court. For this age group, the standard tennis net height can be used. Just as kids need a court that suits their size, they also need the right size equipment. That's why both the racquet and ball are different from the equipment adults use. Balls: For ten-and-under players, a low compression ball moves a little faster and travels farther than the ball used with the younger group, however, it still has a lower bounce than the original. Scoring: Ten-and-under players should play the best-of-three sets; the first to win four games wins a set. For the third set, the first player to win seven points wins the match.